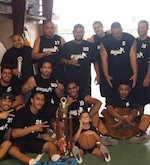 Two American Samoan players were selected in the Oceania All-Stars team after the 2006 FIBA Oceania Youth Tournament. The team made a tour in Australia and played in the U20 Nationals against the best australian players born in 1988 and 1989. The Oceania All-Stars were unable to win a single game in Australia but all the players should have learn a lot in this tournament. Ata Perese (203-C) made some great games and was one of the best center in the tournament, on the other hand Vailili Malau'ulu (F) had more troubles to play his game against the australian defense.